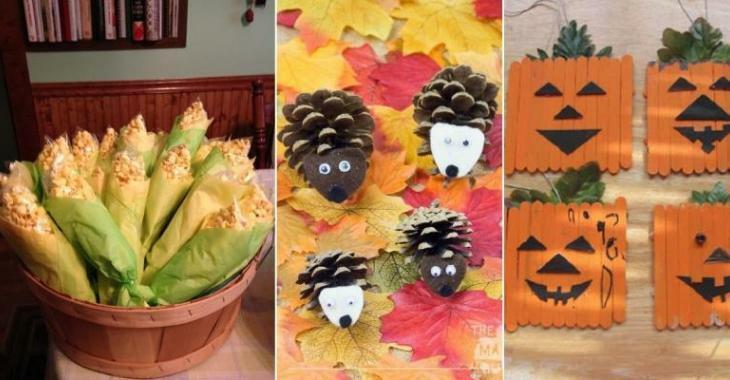 Crafts : 10 Autumn DIY ideas for having fun on cold days! 10 Autumn DIY ideas for having fun on cold days! Autumn crafts and Halloween crafts that you can do with DIY! You know what the best is? You already have everything at home or you can easily find the materials in craft stores! Have fun alone, with kids or even your grandchildren! Get inspired by these DIY to find other ideas! It is by practicing that you become an expert in tinkering! ENJOY YOUR DIY PROJECTS ! Glue popsicle sticks on a cardboard and paint the sticks with orange gouache, make the faces with black felt or black cardboard, glue artificial leaves to the back. Small google eyes and tiny tassels on triangles of felt on pine kernels to make adorable hedgehogs! Cut out cardboard plates in the shape of leaves, then ask the children to stick silk paper squares on the leaves! Use Lego blocks to make round inking stamps! It's fun to paint ears of corn! Easy DIY project with pumpkins! Use cardboard plates, pipe cleaners, gouache, and black cardboard! Stick dead autumn leaves on a cardboard to DIY a cute hedgehog! Use the feet and hands of the children to make a scarecrow, a crow and corn cobs with gouache! Did you plan a movie day with the children? Offer a bag of popcorn in a very original way! Wrap the bags in green and yellow colored silk papers! ADORABLE ideas!